The Pizza Cutter Fork | OhGizmo! 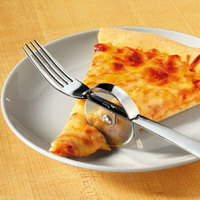 Move over “spork”, there’s a new bad boy in town, and it’s the unfortunately named “Pizza Cutter Fork”. As you can see from the picture, it’s a simple fork with a smartly integrated pizza cutter. That way, you can eat your pizza with one hand, leaving the other to drink your beer. If you happen to be watching the game, in the company of a scantily clad lady by your side, I have bad news for you: you have died, and are now in heaven. Now, if only they could find a good catchy name for this $6 invention… The “Picuork”? The “Pizcufork”? Eh, sounds a little douchebaggy. Anyone want to give it a crack? Buy it here. Story VIA BookOfJoe. this is stupid. can’t you just hold the pizza in one hand and your beer in the other? What kinda douche eats pizza with a fork? I would use this to cut up my pizza slices, use the fork side to dish it up if its hot. Ingenious! No you retardo. You don’t get the idea. Imagine you’re on a sofa. No table in front of you. On your right, you put you piping hot pizza on a plate. On your left is your gal. In your left hand is a beer. You’ve got no place to put your beer down, it would just fall on the sofa. How are you going to eat the pizza now, without this thing? You can’t ask her to hold it for you, how lame is that? You can’t take it in your hand, it’s too hot. “You can’t take it in your hand, it’s too hot.” Wait 20 seconds for it to cool you fat @&%$! Assuming you have a girl, she won’t be there long if you start eating piping hot pizza with this most worthless of products. It’s more worthless then playing marco polo with Helen Keller… Marco, Marco, Marco, Marco, etc. If your girl won’t hold your beer, get a new girl. you’re just jealous you didn’t think of it first! Using a fork to eat pizza is like using AOL to surf the web…both are unnecessary and both are ghey! Sorry, but I don’t like it. Casey and I are doing one for a project it is going to blow this one out of the water!!!!!! pizza hut still my preferred place to get pizza. It just rocks! How about: IZZ- A- FORK ? Pronounced like Pizza but with out the P. sorta sounds Italian! LOL! Pizzork… But really, this is a nightmare utensil for anyone who still handwashes their dishes!